I believe that we learn our way out of our dilemmas. Messy decisions, heart-stopping grief, ridiculously selfish leaders—all take our attention from what most concerns us: our next breath. Breathless, anxious, and hurried, we find our ways when we turn obstacles into challenges, our wreck-sites into studios—all by a shift of mind, a frameshift. Frameshifts was a practice before it was a fiction. Human beings can see beyond the worlds and wounds they have created. They have imagination–but, as Mark Twain said, you can’t “depend on your eyes when your imagination is out of focus.” Every frameshift is a change of magnitude, scale of observation, viewpoint, and metaphor. To shift frames frequently is to overcome the provisional ideas we have about ourselves, the way things are, and the way to tell the story. There’s nothing wrong with provisional truths as long as we don’t settle for them. Stories about a quiet deal made by a city councilman unaware of the lethal consequences; about a young Air Force officer’s choice between career and corruption; about how the suicide of a young gay teacher draws friends and enemies into a tangle of betrayals; about the slander, Joe-job and murder of an activist, and stories about a strange theocratic community, its technology, and its Supreme Prophet. Left with the debts of a husband who invested in start-ups as if he were ordering pizza toppings, June Brightman could only stare at the wreckage of her life until she met Harry Pettiford. That’s when her perspective began to shift. Everyday shifts of view, slight changes of routine, learning something new, taking on a new duty or responsibility, small acts of resistance to authority—frameshifts. If consciousness evolves, it is because we pay attention to the resistances in our lives—and to our dreams. Learning occurs at the pressure points. Caught between his wife’s need for 24-7 nursing care and his disappearing retirement income, Harry Pettiford leaves Roanoke to live with his aged aunt near Alexandria so that he can do public relations for a politician struggling to retain his seat on the city council. When the councilman is murdered, the pressure on Harry closes like a vise. 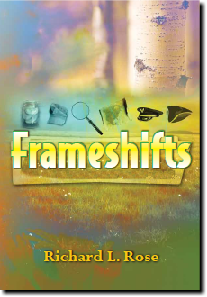 Like all good survivors, the characters in the Frameshifts learn to work with what they have—a bit of science, a potted plant, a poem, a math theorem, a few pieces of gravel from the malpais lands of New Mexico. They put their imaginations to work. For readers, each story is a different kind of discovery, each a different genre, each a different journey, each with a slightly different cast of characters. But there’s more. The stories in Frameshifts are for readers open to a path that twists through mysteries, suspense, philosophy, poetry, history, military escapades, dramatic dialogues, letters, lectures, adventure, fictional memoirs, science fiction, dystopia, and political intrigue. Whether you want a whodunit, a lost missile launch code, the sinister results of the petty politics of town councils and school boards, genetic engineering gone awry, or a utopian reform of agriculture and society that seems almost too perfect, then these stories are for you. Do you know so much that you call the slave or the dullfaced ignorant? Do you suppose you have a right to a good sight . . . and he or she has no right to a sight? Do you think matter has cohered together from its diffused float, and the soil is on the surface and water runs and vegetation sprouts for you . . . and not for him and her? . . .